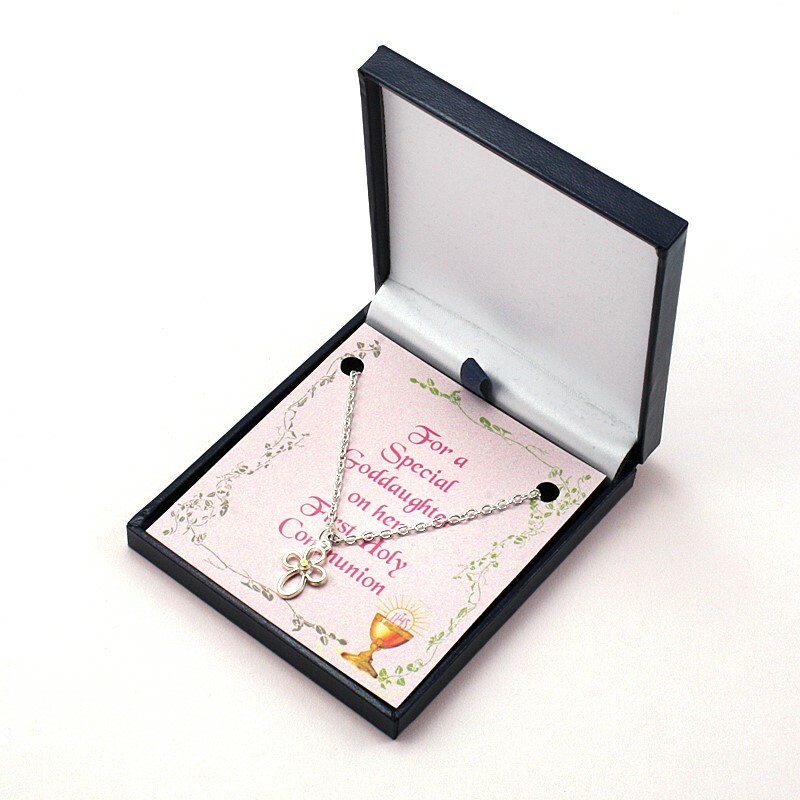 Beautiful, Engraved First Holy Communion Necklace. Free Engraving on the back . Engraved on the front as shown, with chalice and cross image. Beautiful Pearl and Crystal Personalised Bracelet with Bridesmaid Charm. Free engraving on the reverse of the heart. Perfect for adding names, dates, love from.., thank you, etc. Made to order in your wedding colours! Beautiful Open Cross Necklace for Girl’s First Holy Communion. Just £8.99 inclduding Free p&p and card mount for one of the following – For a Special Daughter, Girl, Sister, Goddaughter or Granddaughter. A lovely necklace with a pretty open cross with a tiny Swarovski crystal inset. 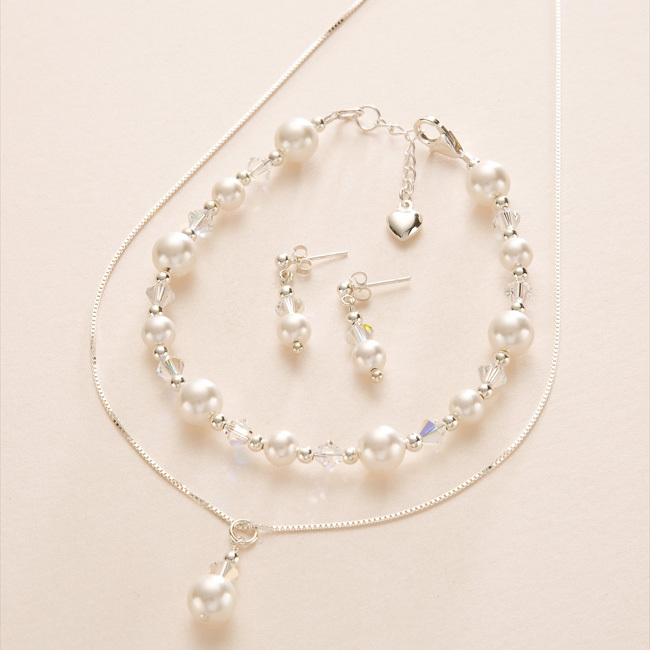 Beautiful Gift for Prom – Swarovski Crystal & Pearl Prom Jewellery Set – Ideal For Brides/Bridesmaids also. Any colour to match her dress! 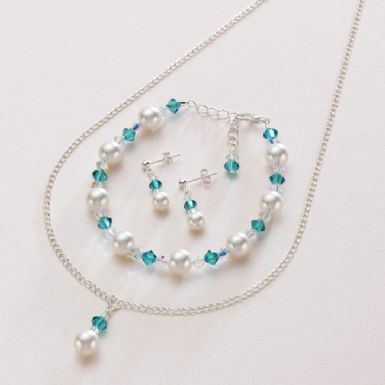 Made with genuine Swarovski Elements crystals and pearls. Beautiful Pearl Bracelet with Engraved tag. 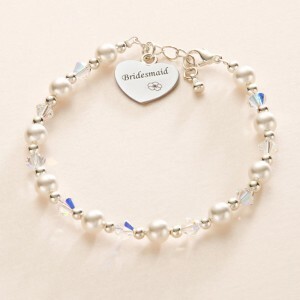 Special Bridesmaid or Flower Girl and optional Free engraving on the reverse. A special keepsake to treasure for years to come. 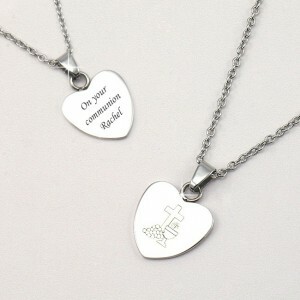 New – Communion Day Ring Necklace with ANY Engraving. Brand New Design – Communion Day Ring Necklace with ANY Engraving. Free Engraving! Free Delivery in the UK! Crystal Birthstone Bracelet on Choice of Card Mounts for Bridesmaid or Flower Girl. Pretty Bridesmaid or Flower Girl bracelets made in your wedding colours! Only £10.99 delivered! (to UK addresses). Huge colour range of pearls and crystals. We make personalised jewellery for brides, bridesmaids & flower girls in a huge range of pearl and crystal colours. Our engraved bracelets make great personalised wedding gifts for bridesmaids and flower girls. Choose any style in any colour! 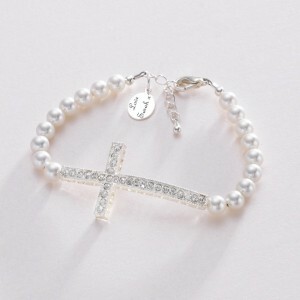 Pearl & Rhinestone Cross Personalised Bracelet with Engraving – Many colours of Pearls available. Made with beautiful Swarovski Elements pearls in your colour choice and statement rhinestone cross. Free engraving on the Sterling silver oval tag. A lovely personalised gift for Horse lovers of any age. 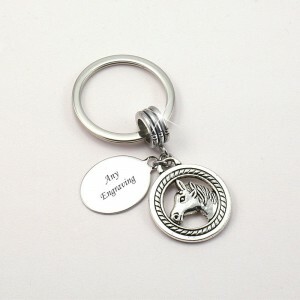 This lovely horse key ring comes with free engraving on both sides or on one side of the oval tag. It has a luxury heavy weight feel.